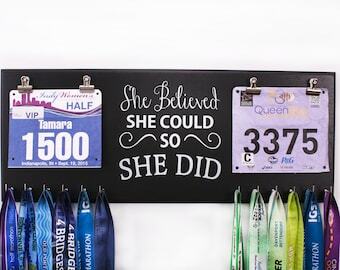 SOLE Mates in it for the Long Run - Double race bib rack and medal display - Great Gift Idea for couples that run. Welcome to Strut Your Stuff Sign Company! We take pride in our handcrafted medal displays and gifts for running, gymnastics, triathlons, swimming and many other sports. Our signs are handmade one at a time. We use high quality Baltic Birch to create our displays. We begin the process with cutting, sanding, and preparing the wood. Then we use 2 coats of paint to give a quality finish. Lettering and graphics are added with our UV printer. Although it is a timely process, we are very proud of our products. 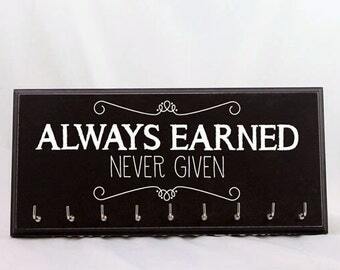 The end result is a piece worthy to proudly display your accomplishments. Great quality board! The hooks were easy to add on and I appreciated the way they did the hooks to avoid damage. Perfect anniversary gift for the 5th year! Very happy with this item. Can't wait to order more! Recipient loved it!! Purchased as a birthday gift; sent and received in a timely manner also! Welcome to Strut Your Stuff Sign Company! Thanks so much for checking out the shop! Strut Your Stuff was originally started by Jenny Doke in 2012. After 6 years of making high quality medal holders, she was looking for a change in careers and approached us about purchasing Strut Your Stuff. In July 2018, we acquired Strut Your Stuff Sign Company. We are thrilled to continue growing what Jenny so lovingly built. We will continue to offer the unique designs that Strut Your Stuff has been known for, as well as adding new designs and products to the shop. We appreciate our customers so much. Putting out a quality product that will meet your expectations is our goal. We look forward to providing you with the perfect medal holder for your home or office. Thanks again for stopping by! Can I use the graphic from one display on another size or shape available in your store? Most of our graphics can be used on any of our displays and we are happy to make that change! Please order from the standard listing and during checkout, make a note to seller with the specific changes you would like. We do accept some custom orders. If you are interested, please send a convo with as much information as possible and we will let you know if we are able to fill your request.